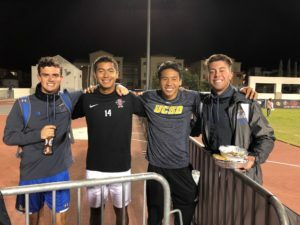 Placer alumni Cody Sundquist, Estaban Zepeda, Zac Wong, and Cameron Douglas, all reconnected at last night’s PAC 12 UCLA versus SDSU game in San Diego. UCLA players Cody and Cameron were in high spirits as they beat San Diego 2-1 with Cody scoring the winning goal in overtime. Great job guys! Go Placer!